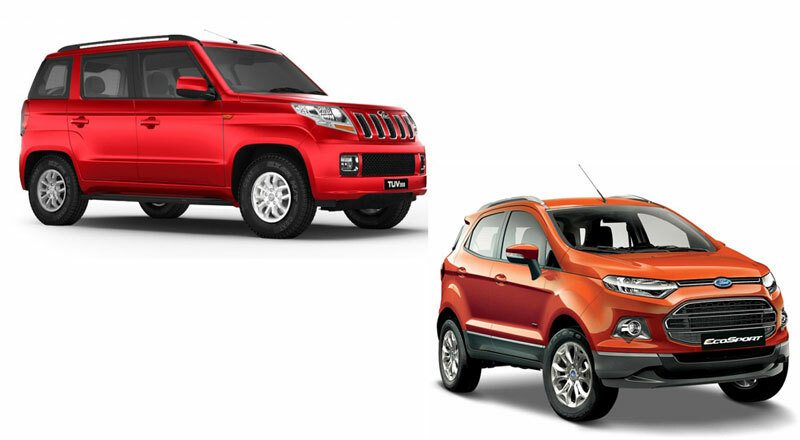 Today we are going to see the comparison between India’s 2 amazing SUVs from Mahindra and Ford which is priced under 10 lakh rupees. Mahindra TUV 300 is the new comer in this segment with 1493cc engine with two stage turbocharger designed to satisfy the BS4 emission norms. 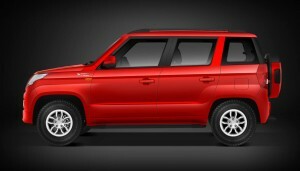 Five speed Mahindra TUV can produce the maximum power of 84 bhp at 3750 rpm and maximum torque 230 Nm at 1550-2250 rpm. Whereas Ford Ecosport is loaded with 1498cc engine that delivers you the maximum power 91ps at 3750 rpm and maximum torque of 204 Nm at 2000-2750 rpm. Ford Ecosport comes in both petrol and diesel option which is priced between Rs.6.75 to Rs.10.2 Lakh whereas Mahindra TUV 300 rolls out only with Diesel option which is priced between Rs.7.13 lakh to Rs.9.3 Lakh. Mahindra TUV 300 has a classic and tough look with bold front grille makes, fog lamps with chrome accents, body colored door handles and sporty alloy wheel gives you the blend of class and modern look that make you to remember the Bolero. Ford Ecosport had a stylish sporty look with best aerodynamic design, stylish front grille and 200mm ground clearance that make to roar in all kind of roads. Comparing the look Ecosport had slight advantage over Mahindra TUV 300. Both SUV uses state of the art technology to stay ahead in the market competition, Ford Ecosport adapts keyless entry that means push start button for starting and stopping the engine, dual front and side air bags, traction control, Anti lock braking system, hill launch assist make your journey comfortable and safer. Mahindra TUV 300 follows micro hybrid technology which switches off engine when idle for 2 minutes and switch on the engine when we press the clutch pedal to give best fuel efficiency, Driver information system, voice messaging system which gives you voice alert about low fuel, seat belt warning. Mahindra TUV 300 provides only front dual air bags along with ABS (Anti-lock braking system) with EBD. Ford Ecosport has best in class rear seating space in 60:40 ratios along with 20 storage spaces, huge space in rear to keep your things. Whereas Mahindra TUV 300 has seven seating capacity with plenty of leg room along with enough head room of 1015mm (first row) and smart storage space.